I know, I know. I said I wouldn’t start sewing again until I had my new sewing space fully organized. Although it’s closer, it’s not done yet. But, dear reader, I found some more kits! These kits are for sewing projects. Some are giveaways from past Quilt Shop Hops. Others are from a series of thread classes I took a couple of years ago. I pulled out the smallest Shop Hop kit to find that it was for a set of four mug rugs. 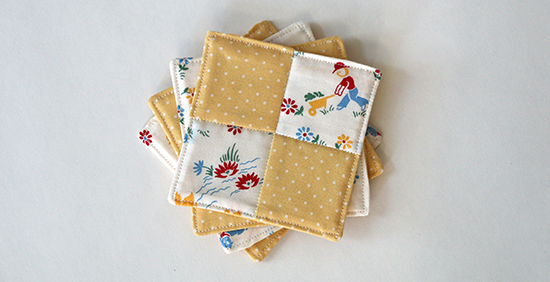 Each mug rug is 3 7/8” square (almost 10 cm), so they’re really coasters because they’ll only fit a cup. Mug rugs are larger so they can accommodate a cup as well as a snack. The kit included three strips of fabric and a small sheet of instructions. I cut the two narrower strips into small squares to sew into four-patch blocks, then cut the wider strip into larger squares for the backings. Scraps of batting from my stash were cut to the same size as the larger squares. The batting and backing squares were larger than the four-patch blocks. The idea was to sandwich the layers together, sew three sides, then trim each side to a quarter inch (0.6 cm) seam allowance before turning everything right side out. The unsewn side was to be stitched together by hand. I didn’t follow the directions completely. After trimming the three sewn sides, I trimmed the corners at an angle to reduce bulk, but I didn’t trim the unsewn side. The little bit of extra fabric made it easier to fold the unsewn seam allowance inward. Instead of stitching the unsewn side by hand, I pressed each coaster with the iron then topstitched around the outside edges. The topstitching flattens the seam bulk while neatly closing the previously unsewn side — and it adds a little decorative touch as well. To finish each coaster, I stitched in the ditch through the four-patch blocks. This was a quick and easy project. I can see myself making more coasters — or larger mug rugs — to use up scraps and make fun little gifts at the same time. Before that, though, I need to finish organizing my sewing space! What do you like to make with small pieces of fabric? Those are cute and a good use of small pieces of fabric. I've made those in the past too. You can make pincushions with small fabrics too. Thank you. Oh, yes, pincushions are another fun little project!